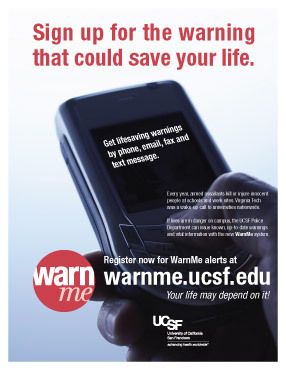 The client, the UCSF Police Department, needed a multi-channel campaign promoting the WarnMe emergency notification system. 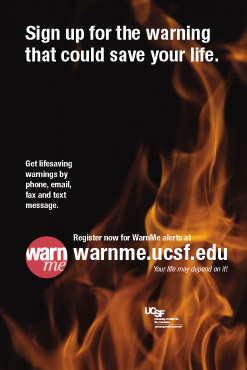 The goal was to get faculty, staff, and students to sign up by entering their contact information on the WarnMe website. I designed and produced several different posters, which were displayed on easels at strategic campus locations. I also designed and produced a flyer, which was circulated to all campus mailboxes, and an email sent to every campus email address. 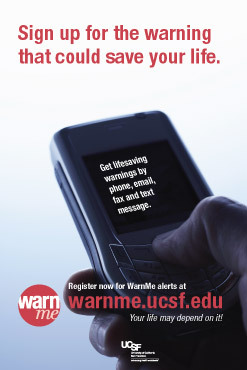 The WarnMe website was given a similar look and feel. The conversion rate for this campaign exceeded 8%.